Why Are These the Best Places for Millennials to Move to in 2019? Looking for a new place to live? We evaluated 325 metro areas and ranked them accordingly to determine the best places for millennials to move to in 2019. Hiking hipsters, blue-collar bookworms, and part-time party animals all need a solid foundation for living. We aimed to find out which places are more than flashy cultural epicenters—instead, we focused on areas with low unemployment rates, high immigration flows, low housing costs, and low rates of property crime. 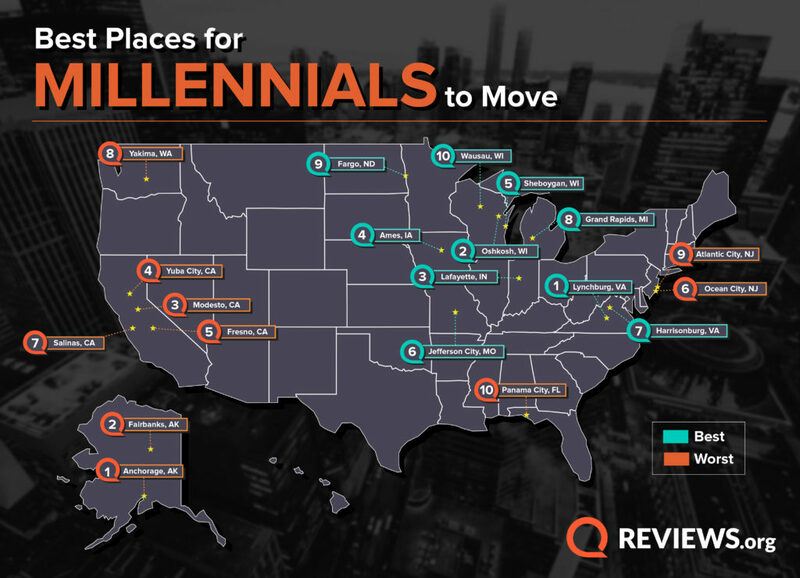 With these criteria, we evaluated 325 metro areas and ranked them accordingly to determine the best places for millennials to move to in 2019. Surprisingly, California wasn’t as prominent as we’d thought it’d be. A high cost of living plus competitive (and fruitless) job hunting can turn a lot of millennials off. And with dang ol’ global warming, who knows which coastal cities will be viable by the time we retire anyway. Ames, Iowa—ranked 4th overall—has the lowest unemployment rate (just 1.4%) of all the metro areas we looked at. All but four of the top 25 best metro areas had a positive net migration, meaning more people moved in than moved out. Sheboygan, Wausau, Appleton, and Green Bay, Wisconsin all had a negative net migration. While Gettysburg, Pennsylvania, has the lowest property crime rate (752.2 per 100,000 inhabitants), it ranked 62nd overall due to its relatively low net migration and higher housing costs. There’s a broad range in the percentage of people spending 30% or less of their income on housing. For example, 48% of the residents in Kokomo, Indiana, who make between $35k–$75k spend less than 30% of their income on housing compared to just 16% of San Jose-Sunnyvale-Santa Clara, California, residents. We also dug into some fun facts and features of our top ten places to see what else makes ‘em special. Each area has its own vibe and its own nooks and crannies to explore—so if anything stands out to you, we encourage you to research it on your own. Or better yet, plan a vacation to visit these beautiful places. You may end up wanting to stay! The City of Seven Hills makes for great hiking—and cultural connoisseurs can go to the Lynchburg Symphony Orchestra, Academy of Fine Arts, or Renaissance Theater. Combined with a low unemployment rate and a low cost of living, you’ll find yourself in one of the best places for millennials to live. Even if you’re not an OshKosh B’Gosh fan, you can find plenty to love about the Oshkosh-Neenah metro area. The area has a high number of production, material moving, and healthcare support jobs ready for undergrads and post-grads to step into. Fan of glass art? The Bergstrom-Mahler Museum has over 3,000 pieces and specializes in historical paperweights and Germanic glasswork. Home of Purdue University, this Indiana metro area is the most densely populated in the state. Architecture fans can visit SAMARA, which is one of Frank Lloyd Wright’s Usonian homes, or scope out Purdue State Bank, one of Louis Sullivan’s “Jewel Boxes” (a series of Midwestern banks). But if chocolate is more your thing, stop by Harry’s Chocolate Shop. rical paperweights and Germanic glasswork. For outdoor lovers, Ames has plenty in the way of parks, golf courses, and bike trails. There’s also a flourishing downtown scene for those who want to explore the city. And for artists lookin’ to scratch their American Gothic itch, you can check out Grant Wood’s largest murals in the Iowa State University library. Or check out Elwood, the world’s tallest concrete gnome, which we also consider an artistic masterpiece. Sheboygan is known for its Bratwurst Days, which includes the Johnsonville World Bratwurst Eating Championship. Looking for a day at the beach? You can enjoy the Dairyland Surf Classic, which is the largest lake surfing competition in the world. Nicknamed the “Spirit on the Lake,” you’ll have fun chillin’ in pontoons on the water or fishing away your days off in Sheboygan. Jefferson City is a great place for career opportunities or starting small businesses. This tourist destination has beautiful and historic locales, like the state capitol, penitentiary, governor’s mansion, and Lincoln University. With beautiful parks, a charming downtown, and beautiful natural scenery, millennials can find a good work/life balance in Jefferson City. Located in Shenandoah Valley, Harrisonburg is great for outdoor activities, strolls to the local breweries and restaurants, or bringing out your artistic and creative side. It’s the home of James Madison University, and it’s a wonderful place for ethnic and linguistic diversity. In fact, the Rosetta Stone language learning software was created in Harrisonburg. We’d definitely be down to check out their Skeleton Festival, which blends Halloween and Día de los Muertos into a big downtown event. If it were us, one of the first stops in Grand Rapids would be the Frederik Meijer Gardens and Sculpture Park, which combines botanical gardens and sculptures, including Iron Tree from Ai Weiwei, a popular contemporary artist. Whether you want to shop at one of the many malls, stay active in one of the many parks, or check out some of the local trails, you won’t have a hard time finding something to do. Oh jeez, it’s the location of one of our favorite movies, so why not let Fargo be one of our favorite cities? You can find about gosh-darn near anything you need in this chilly city. See the great outdoors, explore a lively downtown scene, and enjoy live music almost any night of the week. You’ll have plenty of museums and sports to check out. Plus, with three universities in the area, you won’t have a hard time finding a diverse environment for creativity. Known for its great outdoor scene with plenty of trails, Wausau is a great place for skiers, snowboarders, hikers, golfers, kayakers, and more. There are also plenty of parks around the city. You can cruise around checking out the different art events, diverse restaurants, and breweries and then hit the casinos all night. We looked at four different data points, all equally weighted, to rank each metropolitan area. Unemployment rate: Taken from the December 2018 Bureau of Labor Statistics non-seasonally adjusted table for Metropolitan Statistical Areas (MSAs). Migration flows: Net migration flow for MSAs taken from the 2016 American Community Survey. Housing costs: Percent of people with a yearly income of $35k–$75k spending less than 30% of their income on housing costs taken from the 2017 American Community Survey. Property crime: Property crimes per 100,000 inhabitants by MSA taken from the Federal Bureau of Investigation’s 2017 Uniform Crime Reporting Program. Metro areas that were missing data in at least one of the four categories were not included in the ranking. A total of 325 metro areas were ranked. Millennials don’t all have the same needs and wants, but there are a few things that may motivate this forward-thinking generation to move. With an emphasis on unemployment rates, migration flows, housing costs, and property crime, we found places that provide a solid foundation for living—nightlife and culture are just the cherries on top.